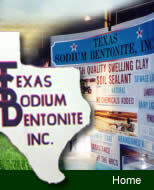 Texas Sodium Bentonite offers certain product and/or services via the Site. Texas Sodium Bentonite charges a fee for its products or services. Please view our product for individual product prices. including costs incurred in connecting to the Sites via the Internet. for access to the Site or for any of its Services. Texas Sodium Bentonite will notify you of any such fees by posting information regarding such fees on the Sites. or violates any applicable local, state, national, or international law. parties or may cause Texas Sodium Bentonite to lose (in whole or in part) the services of its ISPs, vendors or advertisers. You shall comply with all laws and regulations applicable to your use of the Services, the Site, and the Material. including, without limitation, in connection with "spam" e-mail messages or newsgroup postings. or iterative mechanism or the like to gain any sort of benefit from Texas Sodium Bentonite or any of its business affiliates. or endorsements of, the linked third-party sites or the entities that operate them, and such links are provided for convenience only. OR COMPLETENESS OF THE SITES OR THE INFORMATION OR THAT THE INFORMATION MAY BE RELIED UPON FOR ANY REASON. OR THE INFORMATION WILL BE UNINTERRUPTED, SECURE, VIRUS-FREE OR ERROR-FREE OR THAT ANY DEFECTS CAN BE CORRECTED. Texas Sodium Bentonite CANNOT BE HELD RESPONSIBLE FOR ANY EVENTS THAT TRANSPIRE THROUGH USE OF OUR SERVICES. is limited to $100. Some states do not allow the foregoing limitations of liability, so they may not apply to you. Some states do not allow the disclaimer of implied warranties, so the foregoing disclaimer may not apply to you. This warranty gives you specific legal rights and you also may have other legal rights which vary from state to state. or other data supplied by you is, and will be treated as, non-confidential and non-proprietary. or (d) any material uploaded or transmitted by you to the Sites violates any applicable laws or rights of any third party. venue of the state and federal courts located in Texas. of the services or the Site at any time, including the availability of any features, databases or content. Services or the Site. Texas Sodium Bentonite may also impose limits on features or restrict access to parts of the Site. as creating any agency, partnership, joint venture or other form of joint enterprise between you and Texas Sodium Bentonite. as closely as possible the intent of you and Texas Sodium Bentonite as reflected in the original provision. Our phone number is 325-885-2339. Fees for services offered by us are available as described in Section 1. © 2008 Texas Sodium Bentonite. All rights reserved. All other trademarks, product names, and company names or logos cited herein remain the property of their respective owners.